At the very least we migraine sufferers have each other who completely understand each other’s daily struggles. Even if we don’t have the same struggles, we can at the very least relate and understand the difference between a migraine and a headache. Other migraine suffers understand if one of us cannot make it to a group meeting at the library or the mall. That is why I would like to make more friends who also have migraines or other disability similar to myself. I believe that “my disability is actually kind of an ability” to comprehend and give a care. All HOPE Maybe LOST but it’s Never GONE. 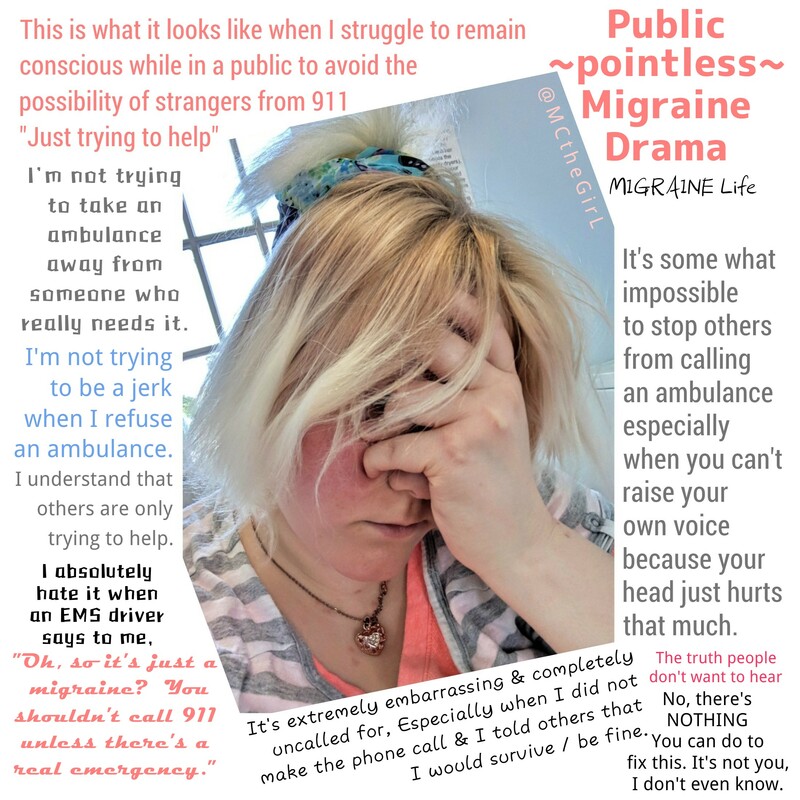 In all honesty, those who don’t have migraines –I know that I have never had a migraine in my life that I’d probably be thinking that migraines suffers are faking– I’m not sure if they actually give a care about people who do have migraines since they can’t understand. I’m not the kind of person who says “boohoo look at me I’m suffering help help help me attention over here” because attention is the last thing on my mind. I usually just want to be left alone. I get annoyed when someone goes on the internet and makes a bunch of posts complaining about migraines without at the very least mentioning anything that’s worked for them in the past whatsoever or anything that they’ve tried to make it better, because then I just feel like they’re asking for attention. I always try to mention something to help, someone in a post about migraines. At the very least I give out education to those who know nothing about migraines. Even if I am just repeating myself… Anything that’s ever worked for me I usually try to let other people know in case that it might help them as well. Cambia is a good thing if you’re able to catch a migraine before it’s officially come on. Migraine excedrin is great in a way, but if you can’t take aspirin then kick Excedrin off your list for sure. Fioricet is prescription only but it’s similar to migraine Excedrin except it does not contain aspirin nor any opiates. I hope that breathes information helps someone. In fairness though, the same could be said about those who have cancer and those who don’t have cancer. The same could also be mentioned when it comes to someone with asthma or a person who’s having a panic attack. I don’t have cancer, so I won’t pretend to understand how it is. I am open and honest about my disabilities, some say I’m too honest but I think it’s better to be honest rather than have to make up some kind of lie and remember it later on like some other people do. I do get panic attacks and I do have asthma, I also know that both are very much different even though with similar effects that are visible to by standards. I just have to slow down my breathing or let myself pass out and then when I wake up everything will be fine pretty much. I can’t slow down my breathing because it’s not like I can really breathe at all. If I pass out especially if my throat is swollen I know that I could suffocate and die. Sure, a panic attack could induce a heart attack or launch plaque from one artery into another artery causing either a stroke or stop the heart basically. You don’t even have to have prior panic attacks or have panic attacks and your family to be suddenly frightened to death. With medication or even simple emotional support from pets, friends or family can really make a huge difference. When it comes to the asthma, if I can’t take in a breath of my inhaler, the ambulance usually shows up and puts a mask on me forcing air in my face with high pressure. Along with Benadryl obviously. I understand that anaphylactic shock and asthma are to completely different things. Usually in my case I have an asthma attack before things get really bad and then I have a panic attack which increases my natural adrenaline. I don’t actually remember that ever happening. I know what people told me happened, but first hand experience I kind of don’t have much memory of that entire day. I’ve been told that the ambulance or EMS people usually inject me with an adrenaline shot along with diphenhydramine, which is basically Benadryl; but I can’t swear it. So I wouldn’t be able to say for sure if it even ever happened. I usually either wake up in the hospital or wake up in my bed at home with parts of memory. Basically, I’ve learned my lesson to stay away from peanuts. I don’t usually have that kind of problem anymore with the panic attacks, the asthma or allergy problem now that I take multiple prescription allergy medicines on a daily basis along with having an emotional support pets. Also, I make a point to stay away from foods and allergies to in general. I know that it seems like I’m bragging in a way of not having to deal with such things anymore, but I do still deal with them on a daily basis by taking the allergy medicine. It’s obvious you can’t judge a book by its cover, but sometimes it’s too obvious do not notice. For example when the beginning and the ending of the story is on the cover itself, it kind of makes second guessing the book pretty pointless. Sometimes the cover is the exact opposite. If you see a cover with happy smiles with animals and children all around, having a party but then when you open the book it’s about nothing more than gloom and death. Yeah, I went there. Other times you’ll see a cover that looks super depressing and even perhaps satanic with markings on it being all red and black with the design of the cover, but then you open the book and it’s filled nothing but uplifting poetry and talks about how life isn’t all that bad. That kind of stuff exists in books and therefore has to exist in people because people write the books and design the covers themselves. ALL HOPE MAYBE LOST BUT IT’S NOT GONE.